Only 2,333 Council Houses in Aylesbury Vale left – opportunity or problem? The ‘Right to Buy’ scheme was a policy introduced by Maggie Thatcher in 1980 which gave secure council tenants the legal right to buy the Council home they were living in with huge discounts. The heyday of Council ‘Right To Buys’ was in the 80’s and 90’s, when 1,719,368 homes in the country were sold in this manner between October 1980 and April 1998. However, in 1997, Tony Blair reduced the discount available to tenants of council houses and the numbers of properties being bought under the Right to Buy declined. So what does this mean for Aylesbury homeowners and landlords? Looking at the figures for our local authority, whilst the number of ‘Right to Buys’ have dwindled over the last few years to an average of only 124 ‘Right to Buy’ sales per year, one must look further back in time. Looking at the overall figures, 5,760 Council properties were bought by council tenants in the Aylesbury Vale District Council area between 1980 and 1998. Big numbers by any measure and even more important to the whole Aylesbury property market (i.e. every Aylesbury homeowner, Aylesbury landlord and even Aylesbury aspiring first time buyers) when you consider these 5,760 properties make up a colossal 11.5% of all the privately owned properties in our area (because in our local authority area, there are only 49,702 privately owned properties). Aylesbury first time buyers and landlords can now buy these ex-council properties second hand as those original 80’s and 90’s tenants (now homeowners) have more than passed the time of any claw back of the discount they received (council discount was repayable if the first owner sold within a stipulated time period - usually 5 years). Yes, the modern stuff being built in Aylesbury is lovely, but some landlords purchase buy to let property solely based on where they would choose to live themselves, instead of choosing with a business head and choosing where a tenant would want to live ... because remember the first rule of buy to let property … you aren’t going to live in the property yourself. What an ex-council property may lack in kerb appeal can be more than made up for in other ways. Tenants are often more worried about how close the property is to a particular school or family member for child care. Whilst ex-council properties tend to increase in value at a slower rate than more modern properties, that is made up for by the higher yields – and those built between the wars or just after are really well built. Tenant demand for such properties is good since Aylesbury property values are so expensive, a lot of people can’t get mortgages to buy, so they will reconcile themselves to renting, meaning there is a good demand for that sort of property to rent. The very fact the council were forced to sell these Aylesbury properties in the 80’s and 90’s, means that today’s younger generation who would have normally got a council house to live in themselves, now cannot as many were sold ten or twenty years ago. Where did that squirrel go dad? Has owning a home become an unattainable dream for the 919 Aylesbury 28 year olds? My parents bought their first house in the 1960’s, they were in their early 20’s. Interestingly, looking at some research by the Post Office from a few years ago, in the 1960’s the average age people bought their first house was 23. By the early 1970s, it had reached 27, rising to 28 in the early 1980’s. This year alone, 919 people in Aylesbury will turn 28 and 847 in 2017 ... and 807 in 2018 ... year in year out the conveyor belt carries on ... where are the Aylesbury youngsters going to live? Ask an Aylesbury ‘twenty something’ and they will say they do not expect to buy until they are in their mid thirties - seven years later than the 1980’s. Some people even say they will never be able to buy a property and the newspapers have labelled them ‘Generation Rent’ as they are people born in the 1980s who have no hope of getting on the property ladder. One of the major problems facing young Aylesbury people is the large deposit needed to get a mortgage ... or is it? The average price paid for an apartment in Aylesbury over the last 12 months has been £158,000 meaning our first time buyer would need to save £7,900 as a deposit (as 95% mortgages have been available to first time buyers since 2010) plus a couple of thousand for solicitors and survey costs. A lot of money, but people don’t think anything today of spending a couple of thousand pounds to go on holiday; buy the latest iPhone upgrade or the latest 4K HD television. That amount could soon be saved if these ‘luxuries’ were avoided over a couple of years, but attitudes have changed. Official figures, from the Office for National Statistics, show the average male in Aylesbury Vale with a full-time job earns £670.80 per week whilst the average female salary is £441.20 a week, meaning, even if one of them worked part time, they would still comfortably be able to get a mortgage for an apartment. I was reading a report/survey commissioned by Paragon Mortgages from the autumn of last year. The thing that struck me was that when tenants were asked about their long term housing plans, some 35% of participating tenants intend to remain within the rental sector and 24% intended to buy a house in the future, with the proportion of respondents citing the “unaffordability” of housing as the reason for renting privately increasing from 69% to 74%. However, in the starter home category of property (i.e. apartments), nine times out of ten the mortgage payments to buy an Aylesbury property are cheaper than having to rent in Aylesbury. It is the tenant’s perception that they believe they can’t buy, so choose not to. Renting is now a choice. Tenants can upgrade to bigger and better properties and move up the property ladder quicker than their parents or grand parents (albeit they don’t own the property). Over the last decade, culturally in the UK, there has been a change in the attitude to renting so, unless that attitude changes, I expect that the private rental sector in Aylesbury (and the UK as a whole) is likely to remain a popular choice . With demand for Aylesbury rental property unlikely to slow and newly formed households continuing to choose the rental market instead of purchasing a property. I also forecast that renting will continue to offer good value for money for tenants and recommend landlords pursue professional advice and adopt a realistic approach to rental increases to ensure that they are in line with inflation and any void periods are curtailed. Local landlords read the Aylesbury Property Blog to make sure they are able to make the most of their investments. Nala enjoying walks in the sunshine. As readers will be aware Saturday 19th of March was the day of our landlord drop in session. 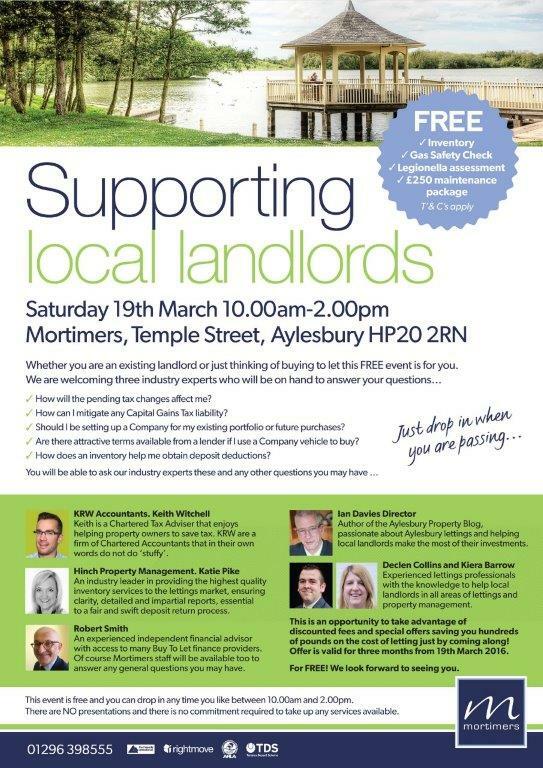 This event had been heavily promoted and offered Aylesbury landlords the chance to meet a tax advisor/accountant, a financial advisor, an inventory expert and the Mortimers team at the same time enjoying drinks and nibbles. There was a healthy turnout and we met several new landlords and others venturing in to the market for the first time. We were able to assist new landlords with information and reassure a couple of them that moving from one agent to another was an easy thing to do, much of the paperwork would fall to us not them. It was interesting to meet new landlords who were venturing in to the market for the first time. They were not fazed by the fullness of market prices and were not put off by the new Stamp Duty rates, understanding that these costs could be claimed back from any Capital Gains Tax bill when they sold the property. Primarily they were looking to buy for the long term and therefore these factors did not feature greatly in their thinking. This landlord has just had an offer accepted on a local property. Although he lives locally he does not know the area well having moved here from London. When it comes to property he is not experienced but does want to get on to the buy to let ladder. The area he has found a property in is primarily Local Authority stock, the agent he is buying from had assured him the area was sought after and a fine location to buy a property for investment. Further the property is three bedrooms. not in great condition and he has agreed a rather full price whilst not being able to benefit from beating the Stamp Duty changes. I believe he is reconsidering his purchase. These are experienced landlords owning two local properties and hoping to acquire a third. They use a local agent to manage their property, have done for years, but were not aware how competitive the market has become amongst agents. If they were to switch agents to us they would save almost £1000pa just on management fees and possibly more after all the add-ons are considered. This first time landlord is also a first time buyer. He wanted to consider buying a property via a company to potentially benefit from the different tax breaks. We were able to demonstrate that initially this would not be the right method of purchase. As a company the pool of lenders is reduced but it is reduced still further to a first time landlord. The costs of setting up and maintaining a company outweigh the costs benefits in this case. Buying to let is not just about choosing a property that feels right, instructing the agent you buy from because you like them and sitting back. There are many aspects that can make a difference. Tom and Janet are just like you, me and many other people in Aylesbury. A hardworking couple who have strived to bring up a family and do the best with what life throws at them. They eventually reached the time in life when they could afford to make an investment in the property market. Their aim? Well just like you and me, when they retire they do not wish to rely on the vagaries of the stock market. They have no desire to rely on a pension pot that will not be the size it was meant to be. They do not have enough capital to live off the miserly bank interest that could be accrued. They do not want to sell the family home and downsize to an area they are unfamiliar with. Their aim is to use the limited capital available to generate a monthly return and if the market is kind to them they will benefit from some capital growth through property value increases. In short they want to protect themselves financially for the future and enjoy their later years. So in 2013 with these thoughts in mind they visited me at a Landlord Drop in Session. They were able to discuss their financial situation, start to understand CGT (Capital Gains Tax), IHT (Inheritance Tax) and the benefits of buying a property to let as well as the most common pitfalls that face first time landlords. 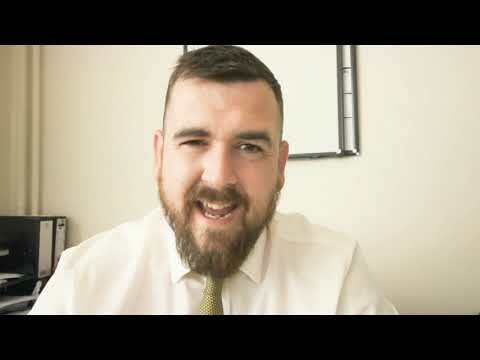 We discussed the most suitable locations and types or property to buy, the likely tenants for these properties and the factors that influence the monthly rent/return. As a landlord you have a choice of chasing yield or capital growth depending on your needs. Many landlords opt for an element of each. It is important to understand how different locations, property types and other factors effect these criteria. After the Landlord Drop in Session Tom and Janet took a period of time to reflect upon the information they had gained and proceeded to purchase their first buy to let property in The Furlongs, Aylesbury. I was able to reassure them regarding the market, achievable rent and suitability of the property they had chosen. In late 2013 the property was readily let to a good tenant. Having got the bit between their teeth and had the success of their first purchase, with our help and advice, another property has since been secured and subsequently let to good tenants. This week on Saturday 19th March we are holding the latest Landlord Drop in Session. It is in our Temple Street office in Aylesbury 10.00am to 2.00pm. No appointment required. There will be experts on hand you can talk to if you wish, there will not be any presentations or boring stuff, no obligation to buy any product or service. New landlords with property to let can get access to our experts for free and be able to take advantage of discounts on our services by attending on the day. Discounts will be valid for three months after the event so if you have yet to complete on a buy to let purchase don’t worry the discounts can still be agreed on Saturday and applied later. Some commentators are saying buy to let is about to die, with the new stamp duty changes and how mortgage tax relief will be calculated. Some say 500,000 rental properties will flood the market nationally in the next 12 months as landlords leave the rental market. Have you heard the phrase ‘Bad news sells newspapers’? Let me explain why buy to let in Aylesbury is only going in one direction – and not the direction the papers say they are going. According to Sheffield University, buy to let landlords will continue fuelling the growth of the private rented sector in the coming decades. By their estimates (and they are considered a centre of excellence on the topic), the rate of homeownership nationally will fall to 50% (today it is 67% in Aylesbury) by 2032, while the rate of private sector renting will increase to 35% (interestingly, in Aylesbury it stands at 16.3% today). Therefore, the demand for rental accommodation in Aylesbury will grow by 964 households in the next five years ... and these are the reasons why, irrespective of the distractions set out in the newspapers. Aylesbury property values over the last six years have risen a lot more than average wages/salaries, meaning as homeownership and mortgage availability is dependent on your ability to pay has served to push home ownership further out of reach for many, at a time when the stock of council houses has actually withered. (Nationally, the number of council houses in the last ten years has dropped from 3.16m to 2.18m households - a drop of 31.1%). Now it’s true the Tory’s efforts to fix the deficiency of affordable housing have focused on those who want to buy a home, ranging from Help to Buy and their much vaunted Help to Buy Isa, and Starter Homes Scheme, an initiative offering a 20% discount for first time buyers … but if you are unable to save for the deposit ... none of this means anything to the ‘20 something’s’ of Aylesbury ... and they still need a roof over their heads! Currently, 11,162 people live in private rented accommodation in Aylesbury. The proposed path of the HS2, all these trees will go. Aylesbury’s continuing housing shortage is putting the town’s (and the Country’s) reputation as a nation of homeowners ‘under threat’, as the number of houses being built continues to be woefully inadequate in meeting the ever demanding needs of the growing population in the town. In fact, I was talking to my neighbour the other day and the subject of the Aylesbury Property market came up in the conversation (as it always does) after the weather and politics. My neighbour said it used to be that if you went out to work and did the right thing, you would expect that relatively quickly over the course of your career you would be buying a house, you would go on holiday every year, and you would save for a pension. But now things seem to have changed? Back in the Autumn, George Osborne, used the Autumn Statement to double the housing budget to £2bn a year from April 2018 in an attempt to increase supply and deliver 100,000 new homes each year until 2020. The Chancellor also introduced a series of initiatives to help get first time buyers on the housing ladder, including the contentious Help to Buy Scheme and extending Right to Buy from not just Council tenants, but to Housing Association tenants as well. Now that does all sound rather good, but the Country is only building 137,490 properties a year (split down 114,250 built by private builders, 21,560 built by Housing Associations and and a paltry 1,680 council houses). 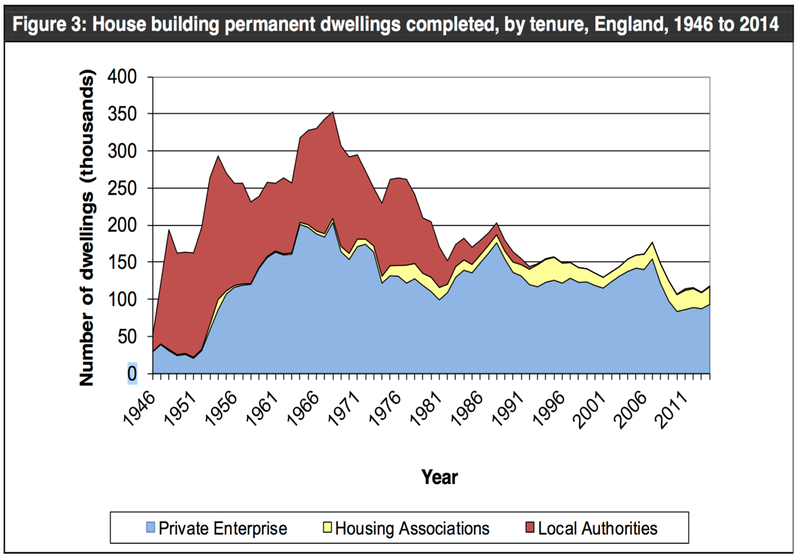 If you look at the graph (courtesy of ONS), you will see nationally, the last time the country was building 230,000 houses a year was decades ago. How George is going to almost double house building overnight, I don’t know, because using the analogy of a greengrocers; if people want to buy more apples (i.e. houses) in a greengrocers’ shop, giving them more money (i.e. with the Help to Buy scheme) when there are not enough apples in the first place does not really help. Looking at the Aylesbury house building figures, in the local authority area as a whole, only 1,100 properties were built in the last 12 months, split down into 730 privately built properties and 370 housing association with not one council house being built. This is simply not enough and the shortage of supply has meant Aylesbury property values have continued to rise, meaning they are 9.6% higher than 12 months ago, rising 0.7% in the last month alone. I was taught at school (all those years ago! ), that it is all about supply and demand, this economics stuff. The demand for Aylesbury property has been particularly strong for properties in the good areas of the town and that it is likely to continue this year, driven by growing demand among buyers. You see Aylesbury’s economy is quite varied, meaning activity is expected to remain relatively strong into the early Summer of 2016. Supply? Well we have spoken about the lack of new building in the town holding things back, but there is another issue relating to supply…the number of properties on the market for sale. The number of properties for sale last month in Aylesbury was 252, whilst 12 months ago, that figure was 389, whilst four years ago it stood at 847… a massive drop! With demand for Aylesbury property rising, minimal new homes being built and fewer properties coming onto the market, that can only mean one thing ... now is a good time to be a homeowner or landlord in Aylesbury.